A Brit living in Finland with her Finnish husband, Mexican dog and English cat, and now, their new baby. Ribs shares her crafty things, general ramblings and interesting things she's found online. 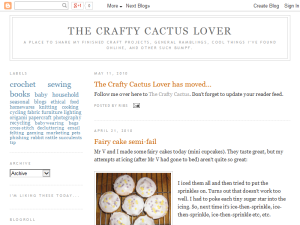 This what your The Crafty Cactus Lover Blog Ad will look like to visitors! Of course you will want to use keywords and ad targeting to get the most out of your ad campaign! So purchase an ad space today before there all gone! Follow me over here to The Crafty Cactus. Don't forget to update your reader feed. If you are the owner of The Crafty Cactus Lover, or someone who enjoys this blog why not upgrade it to a Featured Listing or Permanent Listing?